Tamil Nadu is bordered by Bay of Bengal on the east, Indian Ocean to the south and Arabian Sea on the west. The state represents the true soul of Dravidian culture in the country. 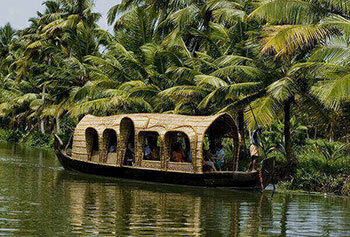 It is the 11th largest state in India situated in the south-eastern part of the country. It was initially a part of the United Province of Madras and has a glorious history of rich vibrant culture, and a natural treasure of beaches and blue clear skies. Tamil Nadu is the abode of some of the most renowned kingdoms of medieval India- the Cholas, Cheras, Pallavas and Pandya kingdoms. It is known across the seas for its popular dance form - i.e. Bharatanatyam, beautifully coloured silks of Kancheepuram, carved wood, stone pillars, and brass temple lamps. It is often referred to as the 'Land of Temples’ since it houses approximately 275 of India’s holiest Shiva temples. 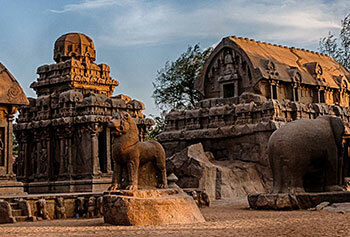 , Mahabalipuram, Kanchipuram, Puducherry, Trichy, Thanjore, Madurai, Kanyakumari, Kodaikanal, Ooty, Coonoor, Chidambaram, Rameshwar, Madumalai National Park and Tuticorin. Tourists must visit Puducherry for its beaches, Auroville, forts, temples and the French architecture, Ooty for lakes, gardens and the serenity, Coonoor for Waterfalls, Lakes, Heritage & Pilgrimage sites and Kodaikanal for its scenic cliffs, forested valleys, lakes, waterfalls and grassy hills. is a World Heritage Site located in Tamil Nadu, approximately 60km from Chennai. It was constructed by the Pallavas back in the 7th and 8th century. These monuments in Mahabalipuram were built by carving out rock along the Coromandel Coast. Fortunately, these monuments withstood the Tsunami that occurred in 2004 and devastated a number of coastal towns nearby. Some of the popular monuments are Ratha Temples that are in the form of chariots, the 11 Mandapas that are cave sanctuaries dedicated to various deities, Rock Reliefs including Descent of the Ganges and Arjuna's Penance, The Shore Temple and other temples that are cut out of rock and The Seven Pagodas. Fort St George, also referred to as the White Town is one of the 163 notified areas in the state of Tamil Nadu. The fort is located on the banks of Bay of Bengal and the complex hosts a number of other monuments. Rama Setu is a national monument and the symbol of national unity, is a stretch of limestone shoals between Rameswaram Island. According to the geological survey, it is a land bridge connection between India and Sri Lanka. The state of Tamil Nadu is not behind any other state, when it comes to adventure! There is diverse topography in the state and hence, there is no sport that cannot be indulged in! You have the option to experience parasailing, yachting, angling and getting soaked in the gushing seawater on your beach adventure trial. In case you are looking for some more adrenaline pumping action, you should try kayaking, rock climbing, rappelling, jungle trekking, mountaineering expeditions,etc. Ooty, Annamalai, Elagiri, Kodaikanal are the perfect locations to go on a hike amidst the green valleys and the mist clad mountains. Tamil Nadu is ahead of all other states in the country when it comes to Angiosperm diversity with approximately 5600 species that counts for one-third of the total flora of India. This comprises of 1560 varieties of medicinal plants, 533 endemic species, 260 species of wild cultivated plants and approximately 230 species that have been red-listed. India’s gymnosperm diversity has 64 species, of which Tamil Nadu has four indigenous types and approximately 60 introduced ones. When it comes to the fauna, there are approximately 2000 native wildlife species of the state. A number of protected areas provide safe spaces for large mammals such as tigers, elephants, leopards, wild dogs, deer, bears and migratory birds including herons, spoonbills, open-billed storks, etc. Marine species such as turtles, dolphins and some migratory ducks are also present. There is a wide variety of fish and insects as well. Some of the popular religious places in Tamil Nadu are: The Chola Temples that were built by the late king Raja Raja Chola and his son Rajendra. These are great architectural sites of glorious heritage. The Cultural heritage site includes the three great temples i.e. the Brihadisvara Temple at Thanjavur, the Brihadisvara Temple at Gangaikondacholisvaram and the Airavatesvara Temple at Darasuram. The temples are a living testimony to the Chola achievements in architecture, sculpture, painting and bronze casting. Meenakshi temple, which is also popularly known as Meenakshi Amman or Minakshi-Sundareshwara Temple and is a historic Hindu temple situated on the southern bank of the Vaigai River in Madurai. It was constructed to commemorate Meenakshi, who was a form of Parvati, and her consort, Sundareswar who was considered a form of Shiva. The temple is located at the centre of the ancient city of Madurai as written in the Tamil Sangam literature. Ramanathaswamy temple is one of the most famous Hindu temples that was constructed in dedication of the god Shiva. It is located on the Rameswaram Islandin Tamil Nadu and is one of the twelve Jyotirlinga temples. It is also one of the 274 Paadal Petra Sthalams and was majorly expanded during the 12th century by the Pandya Dynasty. The state of Tamil Nadu is reflective of a rich cultural spirit that has been rooted in the vibrant past of the region. There are a number of fairs and festivals that take place in Tamil Nadu; some of them being Cape Festival held in Kanyakumari, Car Festival at Kaliyaperumal Temple in Ariyalur, Karthigai Deepam Festival, Kavadi Festival, Natyanjali Dance Festival, Pongal, Tea & Tourism Festival in Ooty, and Chithirai Festival at Madurai. The cuisine of Tamil Nadu is popular across the country because of its rich distinctive taste. A number of items of their cuisine are acclaimed globally and are ubiquitous in their own ways. The main ingredients of their cuisine are hot spices which are used in almost every dish. The medium of cooking is coconut oil which is available in abundance in the state. An everyday meal in Tamil Nadu would contain steamed rice, lentils, grains and vegetables. Special dishes such as hot and spicy mutton or chicken or fish dishes are prepared on occasions as well. One of the specialties is Paya which is a kind of spiced trotter broth and is consumed with parathas and Appam. Idly is the most famous Tamil Nadu food item and is prepared of lentils dried until crispy. Refreshing drinks of Tamil Nadu such as the mouth-watering cocoa drinks, tea and brewed coffee are also famous. Tamil Nadu, apart from offering beautiful sights and heritage spots, also offers exciting shopping opportunities for visitors: both Indian and overseas. It is famous for its rich cultural heritage, which reflects in its exquisite arts and crafts. The creatives of the state are world-famous for their unique style. This unique style can be seen in traditional items such as silk of Kanchipuram, Pattamara mats and the leaf, Tirunellveli's Palmyra-fiber handicrafts, bronze and brass castings and traditional jewellery from Kumbakonam, Tanjore's metal works, stone sculptures, etc. Tamil is the official language of Tamil Nadu. Locals and guides also speak English. The state is well-connected via rail, road and air networks. If you don't want to get into the hassles of booking accommodations, tickets and sightseeing tours, let us take the charge of your next vacation. Our travel experts will be happy to plan a holiday in a budget that is not heavy on your pocket.